Creamy ice cream is so easy, even without an ice cream machine. This version uses whipping cream and dulce de leche, flavored with espresso powder and Amaretto. So here you have it, my first Ice Cream Tuesday post! At the instigation of the great Jenni Field of Pastry Chef Online, we are making ice cream that includes marshmallows in some form. You can find my own almond marshmallow recipe and instructions here. 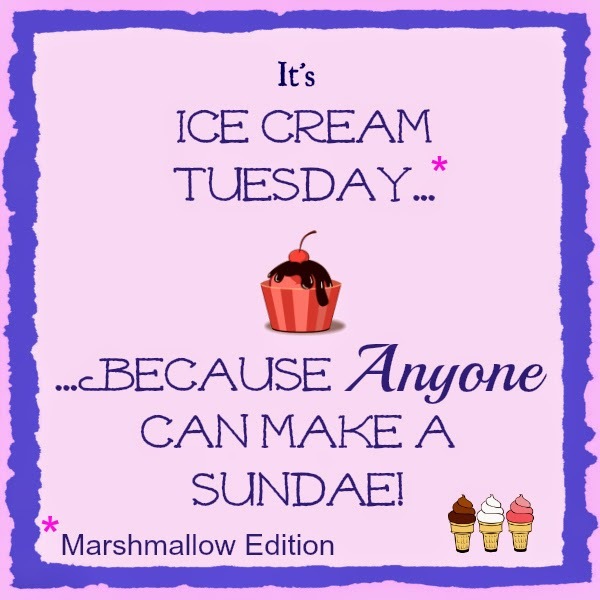 Make sure you scroll on down past the recipe to see all of the Ice Cream Tuesday Mallow Madness links! We are all posting today at different times so if a link isn’t live right now, please try back later in the day. The ice cream base recipe was adapted from one of Nigella Lawson’s on the BBC website. She makes it look so easy and it really is! (You may need a VPN set to United Kingdom to watch.) But you can also find instructions here on Nigella.com. 3 1/2 oz or 100g homemade almond marshmallows from this recipe. In a small heavy saucepan, toast the almonds over a medium low flame until they start turn golden and smell toasted and lovely. Toss frequently to prevent scorching. Turn the fire off and sprinkle the sugar over the nuts. Stir them around as the sugar melts to make sure they are all coated with the syrup that results. Add in the butter and stir again. Pour the nuts out onto a greased baking pan, separate them and leave to cool. In your stand mixer or with electric beaters, whisk the cream, espresso powder and cream of tartar until the cream thickens. Add the dulce de leche and whisk until stiff peaks form. Add the liqueur and whisk again. Reserve a few marshmallows and almonds to add on top of the ice cream. Ever so gently, fold in the candied almonds and the marshmallows. Top with the reserved marshmallows and almonds and freeze for several hours or overnight. Check out all the wonderful creamy, marshmallowy frozen treats we have for you today! And for you visual folks, thanks to Karyn at Pint-sized Baker, we've got clickable photos!